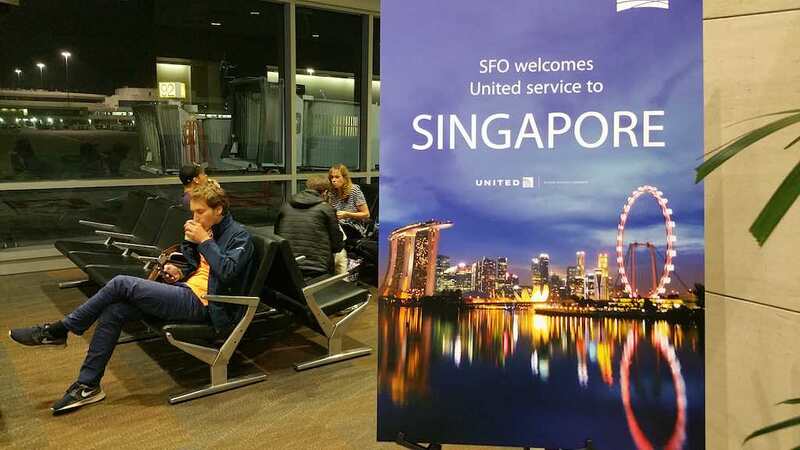 Ultra long flights are now a thing again and some months back United announced that they would be flying from San Francisco to Singapore which is a distance of 8,446M/13,593KM. 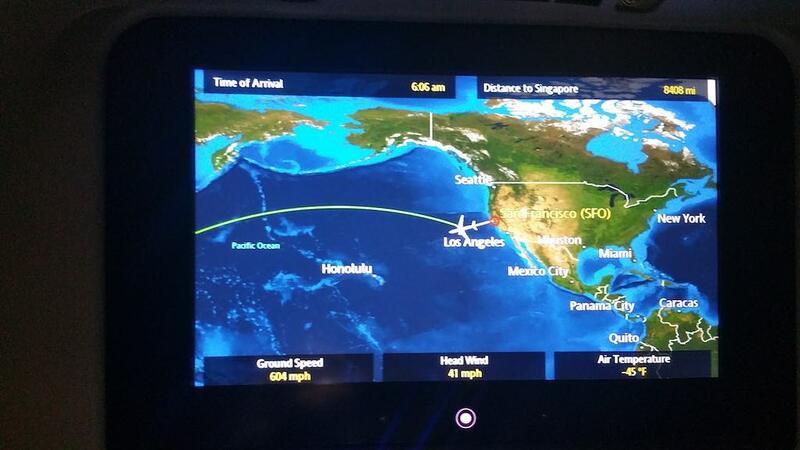 This makes this journey on United 1 (UA1), the 5th longest flight in the world by distance; the longest flown by the Boeing 787 model. 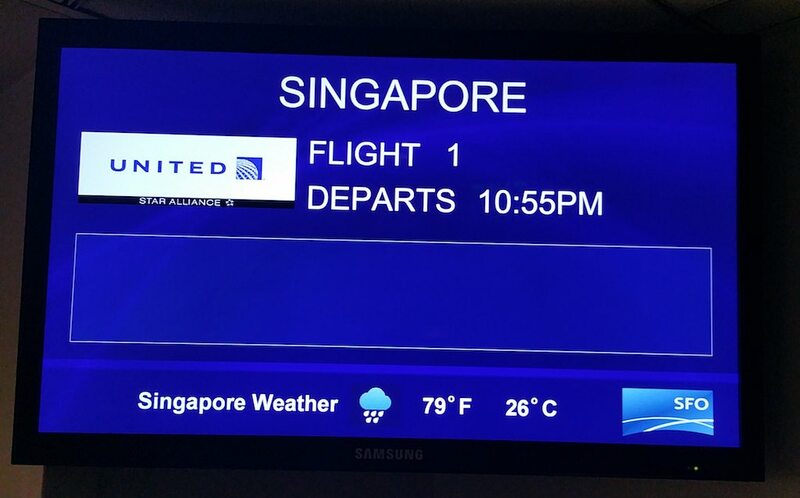 I love ultra long flights and have flown Singapore Airlines’ flight when they used to operate from Newark to Singapore nonstop. Flight time was about 18 hours. 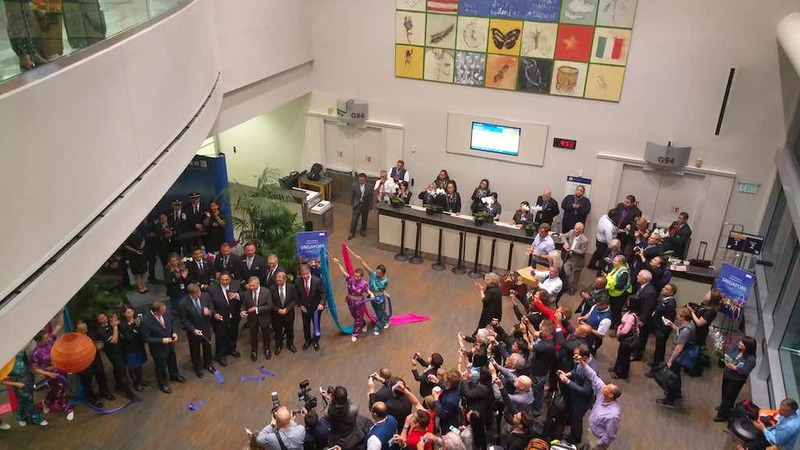 More facts: Its’ the only nonstop service from the U.S. to Singapore by any carrier and its the longest flight by any U.S. carrier as well. Delta’s flight to Johannesburg, South Africa (JNB) from Atlanta, GA (ATL) is just shy at 8,439M. 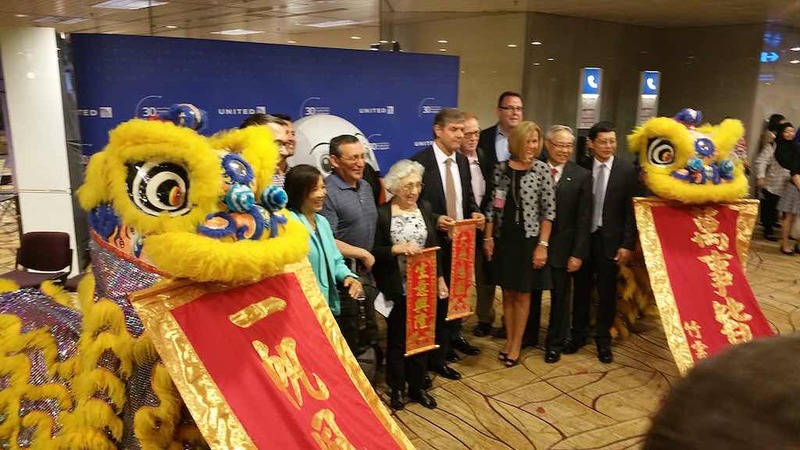 The flight number is United 1 (UA1) which if you are a Continental fan that used to be CO1/2 which flew the Houston to Honolulu to Guam route. I think the original flight 1 was from PanAm which was the round the world flight number. I had completely forgotten about when I saw a blurb about it in the news a few days before it was set to go. Here’s the trip in photos. Enjoy. United 1: Jetway Display Just In Case You Are On The Wrong Flight. Once passenger asked what all the fuss was about. I explained it to him, he said “Oh.” Another did not know that Singapore Airlines used to fly from Newark and Los Angeles to Singapore using the Airbus A340-500. oh and we were also given a passport holder once we were scanned at the gate. 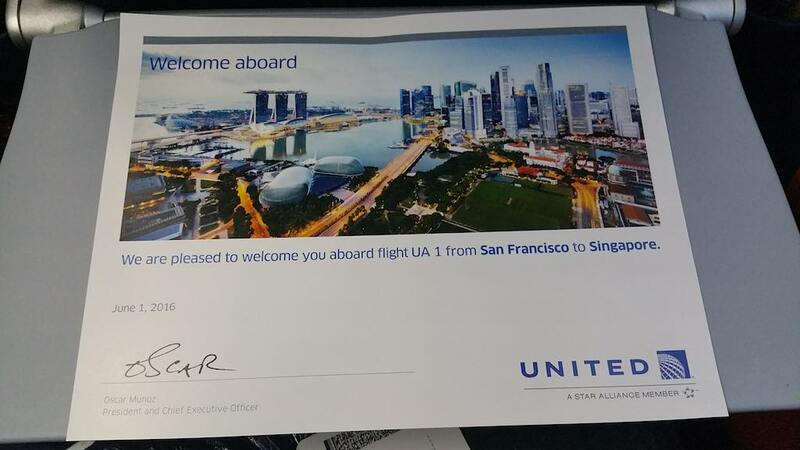 United 1: Welcome Certificate from Oscar Munoz President and CEO United Airlines. Yup, I had the middle seat and it actually was a good one. Seat mates were fine so that helped quite a bit. United 1: Economy Class as travelers get settled in. It’s a 3-3-3 configuration with mood lighting. The Economy class cabin is divided into Economy Plus (88 seats) and regular Economy. 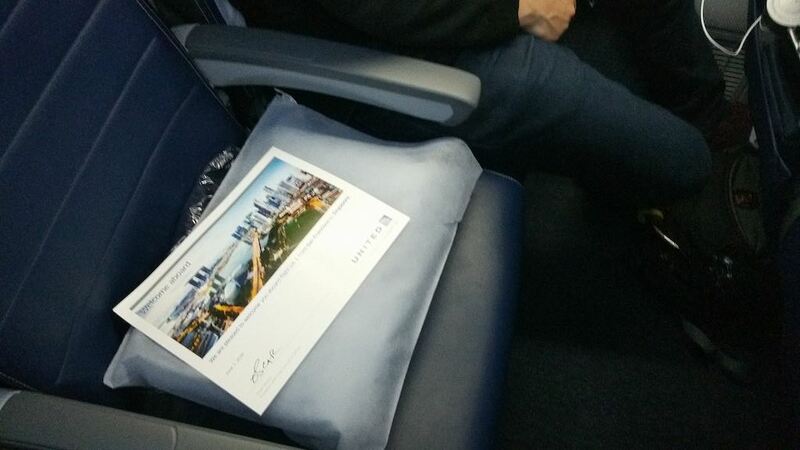 There are 204 seats in all in Economy with 48 in BusinessFirst Class with a 2-2-2 configuration. Each seat has touch screen controls and Audio/Video On Demand. 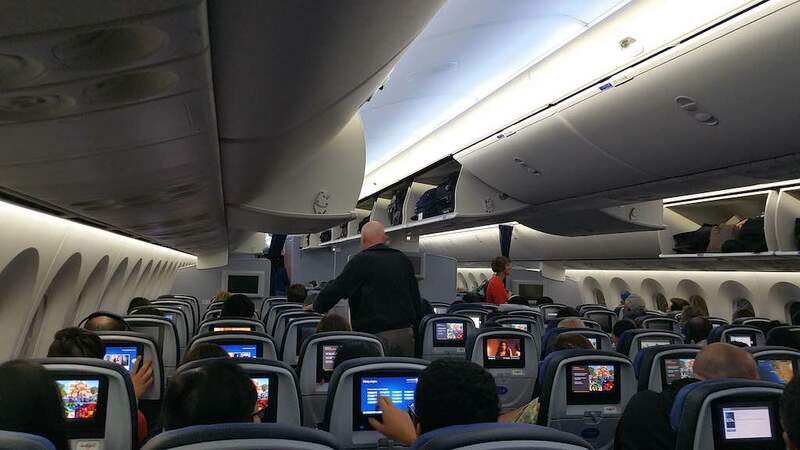 The aircraft is also equipped with Satellite Wifi for a charge and there are power outlets in every row. 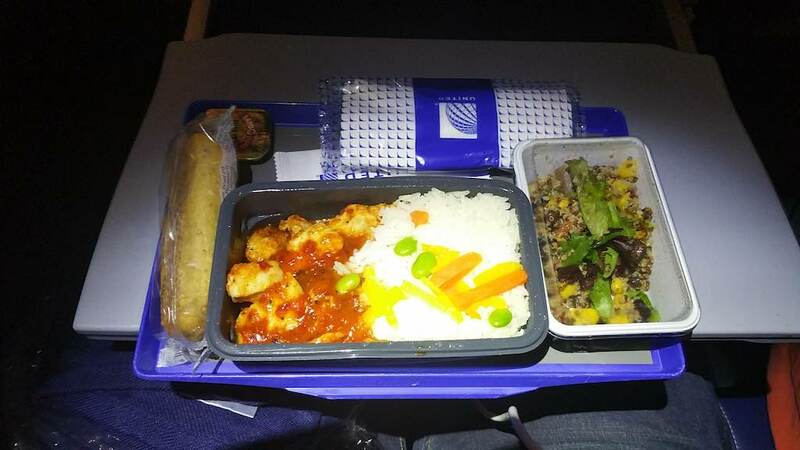 United 1: Economy Class First Meal. The Meal arrived at 12:17a followed by drinks of your choice. Wine and beer is complimentary. I had white wine. It was pasta or chicken with rice. 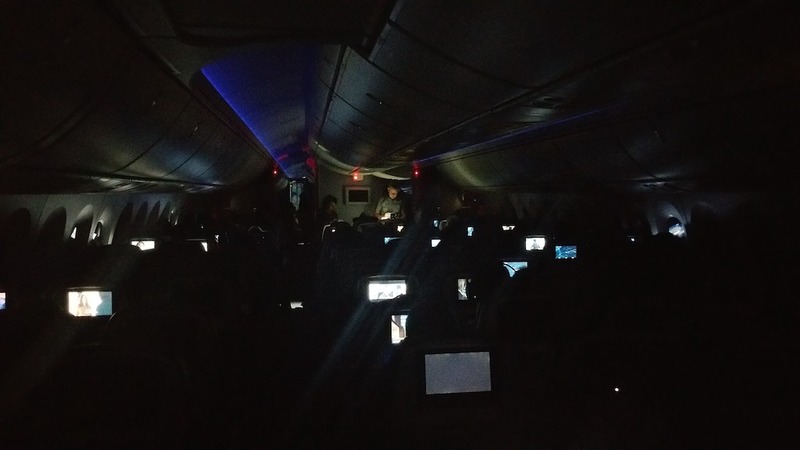 United 1: Economy Class Mood Lighting. After dinner is served, it was time to relax and enjoy the flight. As you can see most were watching movies. It was about this time that I went to sleep and awoke with 7:07 to go. I had slept for about 5.5 hours. 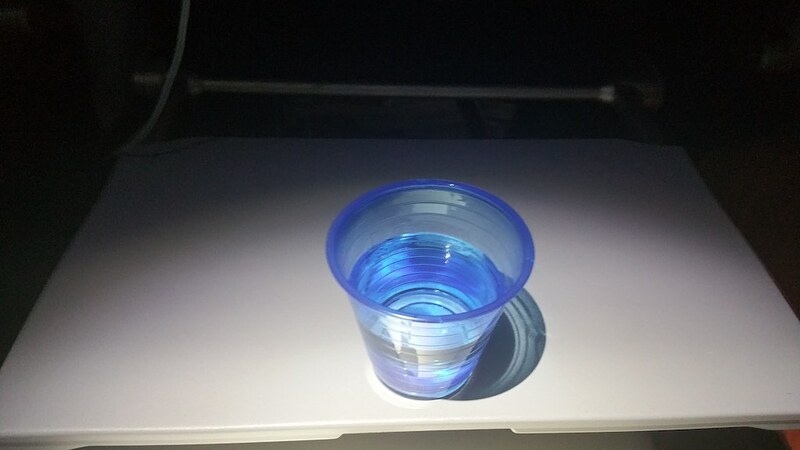 United 1: Sleep Mood Lighting was still in effect when I awoke at 5:59a West Coast Time. My seat mate on the left was asleep, but the on the right was awake so I did a toilet break. 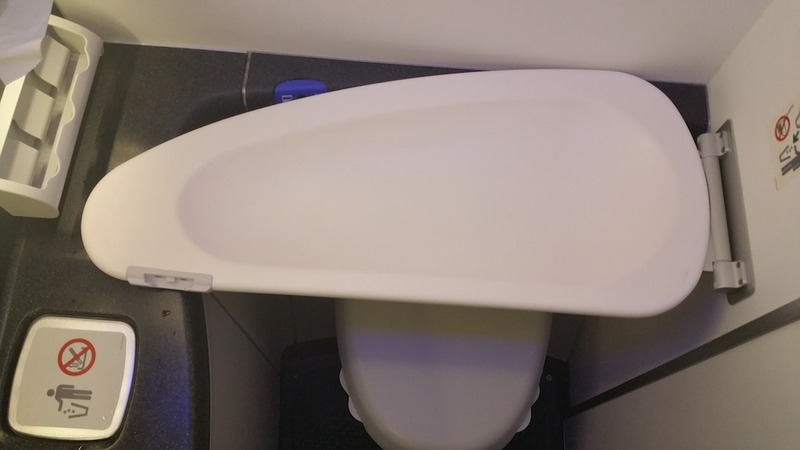 United 1: Toilet Visit. Here you can see the baby changing table is folded down from the right when needed. It is power-assisted so all you have to do is release the latch. To flush the toilet, just wave your hand over the sensor. It now flushes even if its open. 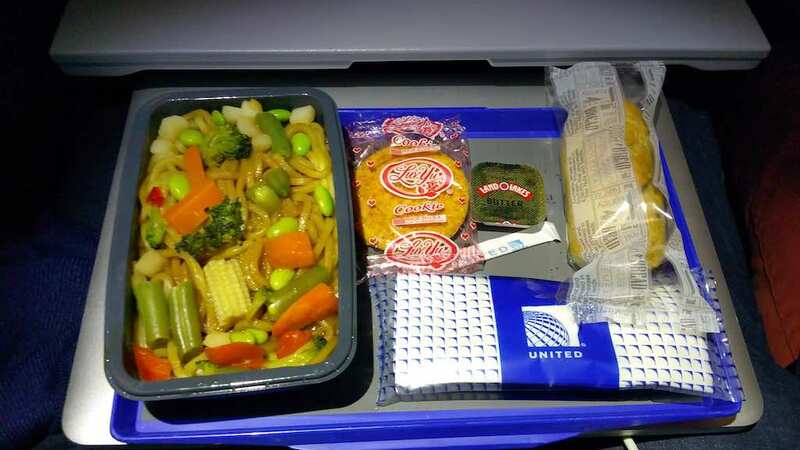 United 1: Snack Time. With 7:47 to go, its time for a mid-flight snack. Its M&Ms plus a turkey and cheddar sandwich on a cornmeal roll. And some water. You could have other drinks as well. It was fun hearing the rustling of the plastic as the other passengers opened their sandwiches. 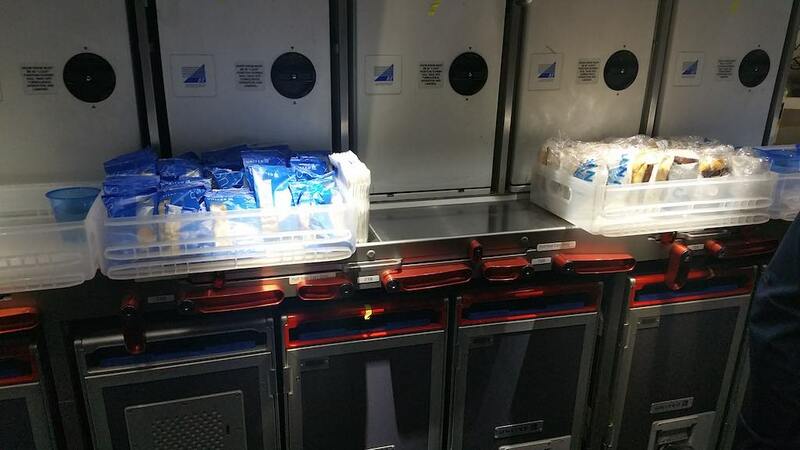 United 1: Snacks in the rear galley in case you need them. 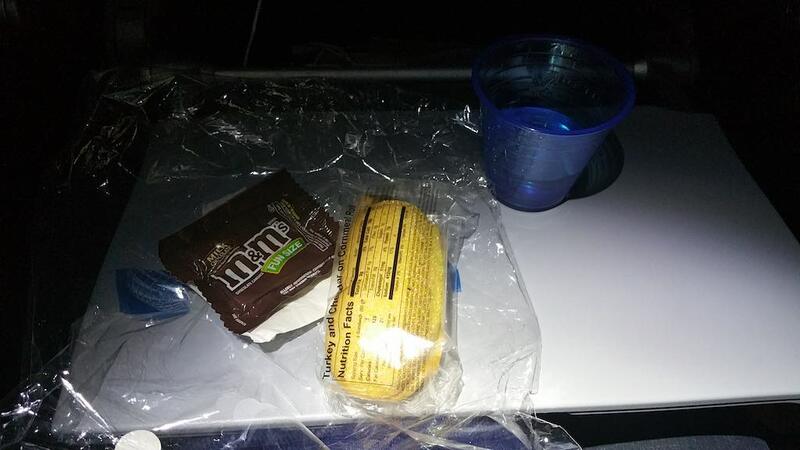 I did take a trip back to the rear galley and found these snacks readily available with water and other drinks upon request. There were lots of people milling around in the galley area as well as at the rear doors. There were also people standing around in the mid galley as well and the doors. 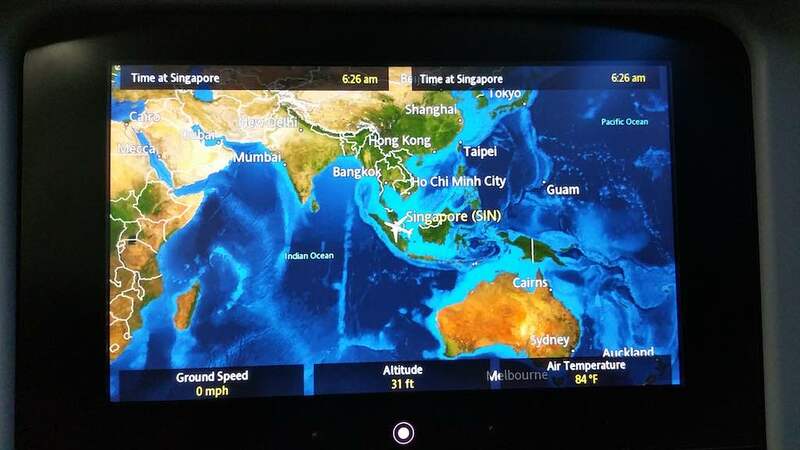 I spoke to one guy who was on his way to Penang, Malaysia and welcomed this flight as it saves him from overnighting in Singapore. He’s shaved 12 hours off his usual trip. United 1: Where are we? I couldn’t go back to sleep so I busied myself with my computer, the Moving Map and the entertainment system. 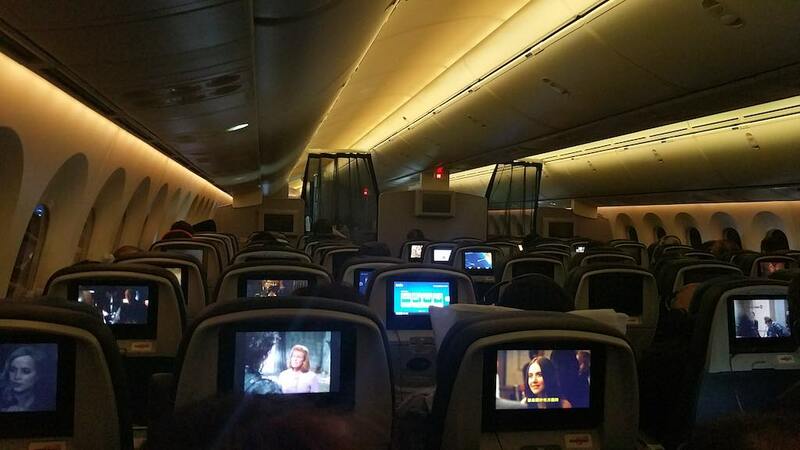 There’s enough movies, TV shows, documentaries, audio to last well beyond our 15:29 flying time today. 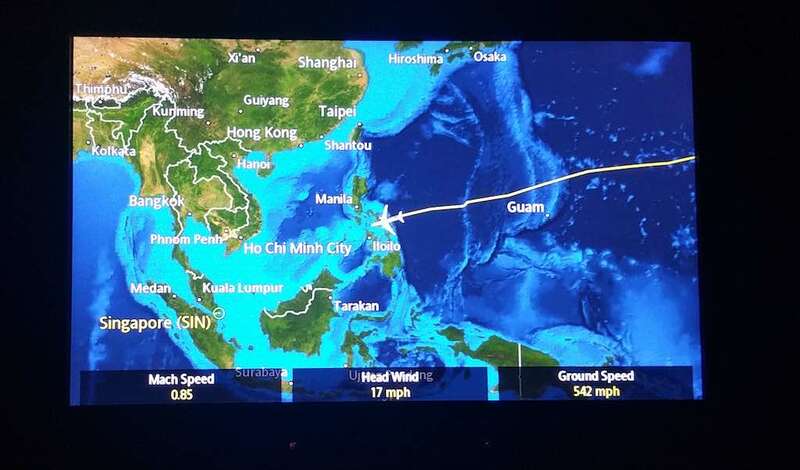 It’s always fun to watch the screen and see that you’re doing Mach .85 at 38,000′ above the the Philippines islands :-). United 1: Water. The crew kept us hydrated the entire flight with frequent passes with water. Plus they had given a small bottle out just after dinner. The blue cups are new. United 1: Breakfast. With 1:44 to go, breakfast was served and the mood lighting also changed. It was a choice of noodles or eggs with your choice of drinks of course. Soon after, we cleaned up and prepared for landing. United1: WaterCannon Salute. 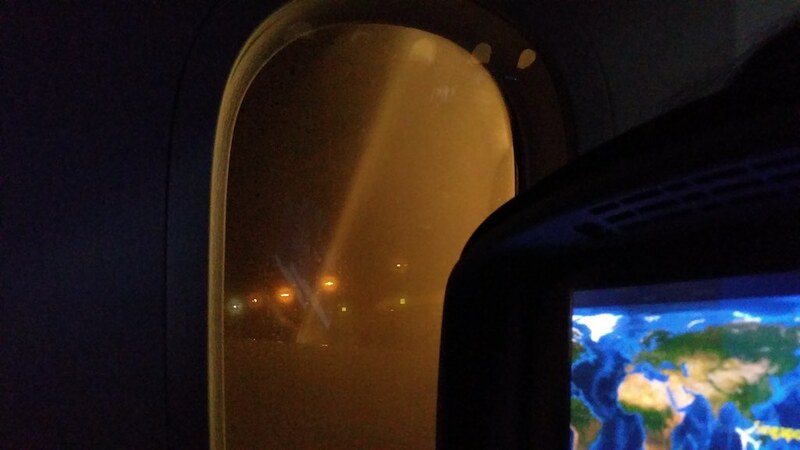 As we pulled into our gate, we received a water cannon salute from the fire engines. 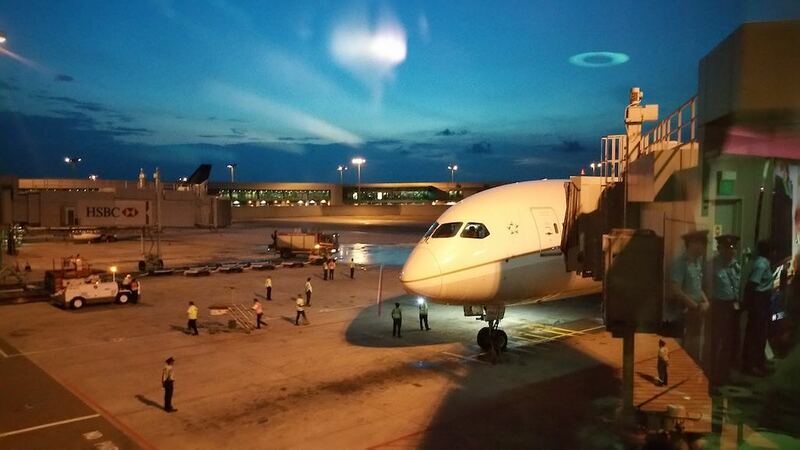 This is typical when a new airline or aircraft type comes to an airport. There were a few cheers and claps as we got sprayed. Cool! United 1: Flight Status. We had to fly around a few storms on the way in and that contributed to the arrival time. 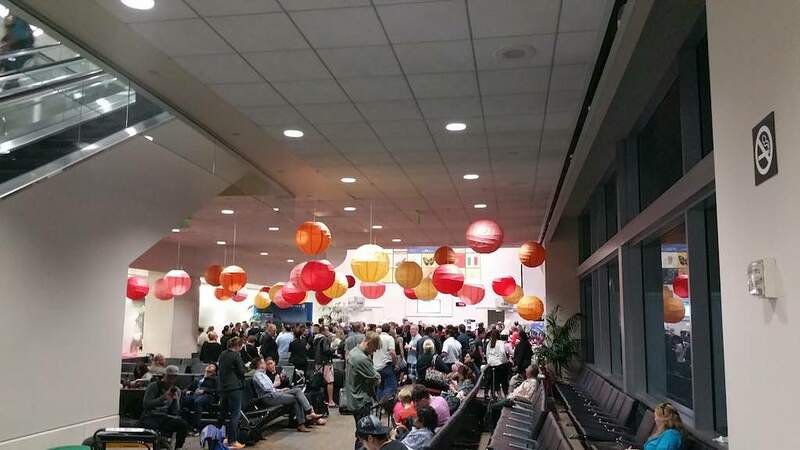 United 1: Airplane at gate in SIN. I tried to get a better shot, but the gate location and angle prevented it. 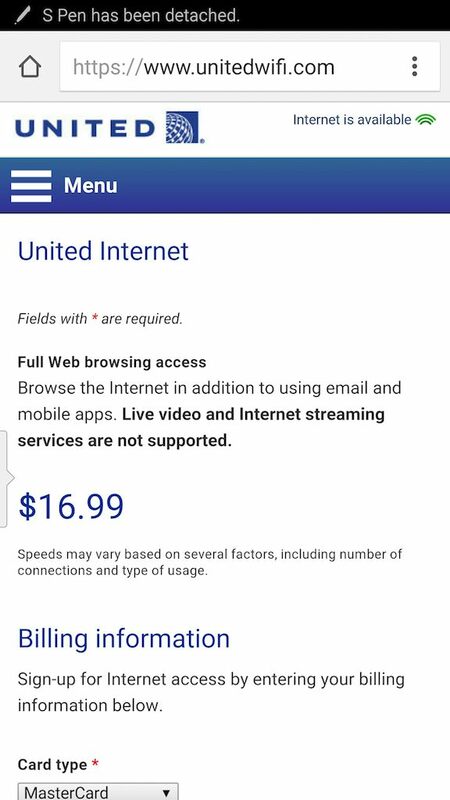 Have you taken this routing on United Airlines? How was your trip? Please leave a comment below. Oh boy, don’t know if I’m up for such a long flight. Could easily do on my own (I think), but with kids in tow…that’s a different story. Probably why we keep going to Europe instead of the other direction. Great reading about your experience! It’s not as bad as everyone thinks, but I can see it being difficult with children. The good thing is that with young kids, its perhaps just a game to them :-). If you’re not up to the long nonstops you can always do some stopovers. I have a page here http://www.cruisinaltitude.com/stopovers that can help you. 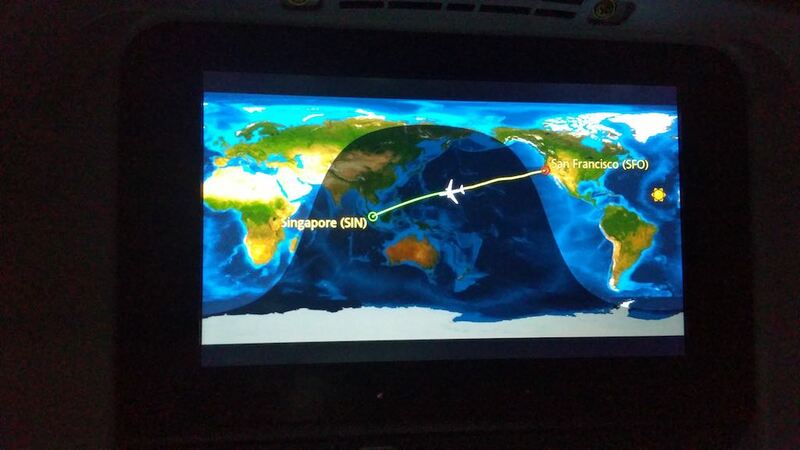 Any suggestions of connecting flights in SIN to complete around the world trip ending back in SFO. I will be doing this flight in two weeks and why not go all the way! Bookings look good…. 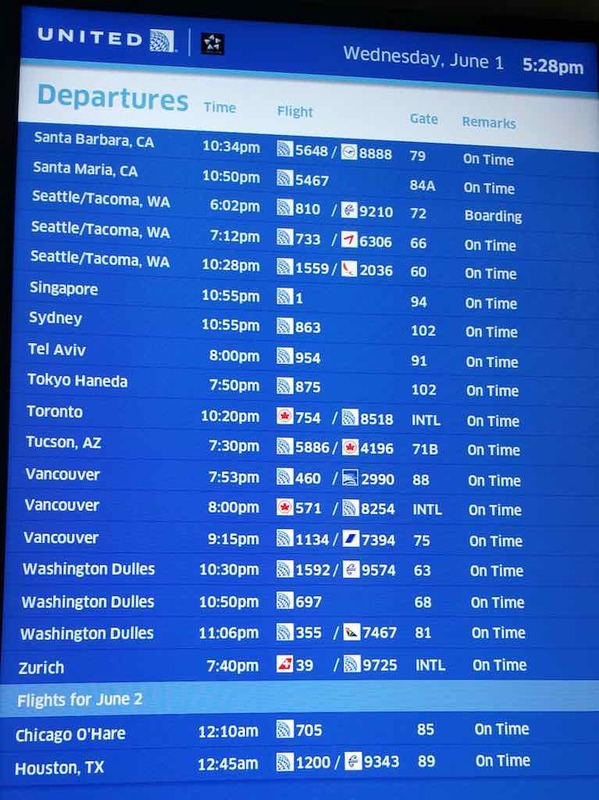 15 hours is my max flight length. I love that you decided to skip a day. Nice write up buddy! My biggest question…why is the flight status page on united.com the same one we created for Continental, oh, 16 years ago! That thing needs an update big time! I was just talking about this flight with my wife and here you are on the first one. I should not be surprised! Yeah, I did notice that. I guess it works, so if it ain’t broke? So when are you both going? Thanks you Carolyn! Makes my day here :-). 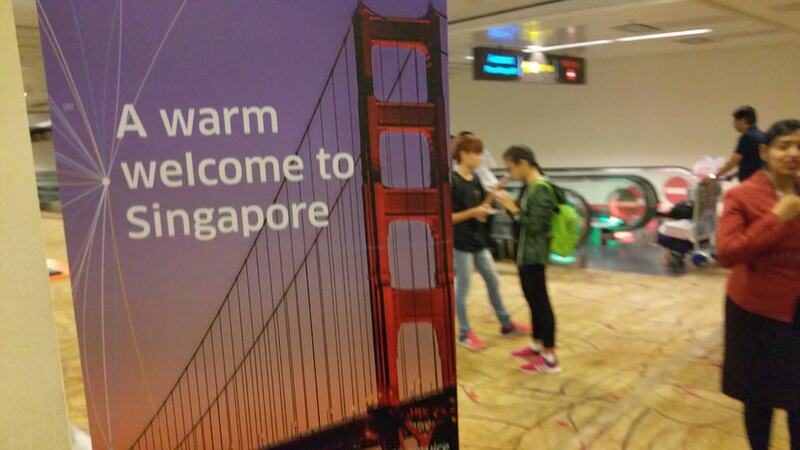 Yeah, Singapore is really great to experience and now you have fewer excuses to get there. So interesting! We’ve done a 16 hour flight.. I’m wondering on the way back to australia this year whether to do a long one or cut it up with 2 stops…. Undecided. Oh do a long one. Just make sure you have audio/video on demand so it will keep the kids occupied. And power so you can work :-). Some have Internet as well. so if you need to keep up you can.